Like I can afford anything right now.... but sometimes it's a lot of fun to make plans! Takes my mind off of how much "fun" work has been lately. Let's get to it.... My first bike lust EVER was at Wheeler's Cycle and Fitness on Wornall Road in KCMO, a long time ago. Sometimes I miss that place. They were the only Waterford dealer in town and, at the time, the only Cervelo dealer in town. While I wouldn't mind a fully lugged and custom-fitted Waterford tourer to replace the Kogswell in the full-rando and cross-country mode.....crud, I'm digressing already. Okay, my first EVER bike lust was for a bright orange Cervelo Eyre-Road. Compared to just about everything else available at the time, there was real technology that went into it. Carbon fiber wasn't yet all the rage.... to a larger extent, nobody had figured out the correct application of carbon fiber yet, so even if you could have afforded a full-carbon bike in '98, you wouldn't have wanted to ride it. So, the Eyre was all aluminum, and, puportedly, very harsh. But, the REAL aero downtube... the forward thinking.... this was what would eventually become my new dream bike. After years of refinement, and the advancement of carbon fiber technology and far-better modulus/temperature control at the fiber level, Cervelo continues to surprise me. What started as a company experimenting with radical time-trial bikes has developed into a true cyclist's bicycle company. The design hints that went into the Eyre road have evolved into what you can see today in the new "S" series, which started out as the "Soloist", which is what I think officially evolved from the Eyre model. 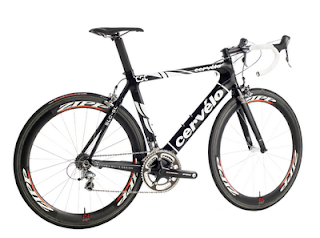 There was also the Cervelo Prodigy, which I think is what evolved into the "R" series of today. So, you have three avenues to explore, looking at Cervelo: The "P" series, the "R" series and the "S" series. The P-series are the purebred timetrial bikes, culminating with the latest and most-awesome P4, which just hit. Ya'll know I work at a bike store that carries these now .... you have no idea how difficult it is to stay focused and NOT just take one of these home with me. Seriously. If you haven't seen the P4 in person, and you are remotely interested in bicycle technology, you HAVE to stop in and see it. This isn't a ploy, you don't have to ask for me - nothing like that. Just come see it. It's insane how much technology is in this frameset. It simply disappears in the wind. The P3, P2 are no slouches, either. Honestly, I've seen the numbers, I've done my own research, and you really can't do better. The "R" series makes a lot of other road bikes look stupid. Seriously. The R3-SL is ridiculously light, compliant where it should be, and stiff where you need it to be. I attempted to match chops with a guy last summer that rode the August 200K 10th Anniversary brevet on an R3-SL. Okay, YES... it's got more to do with the rider than the bike, but once we reached the first hill after making short work of a 9-mile straght-away at 23+ MPH, that Cervelo was GONE. He shifted, stood up, and the bike just leaps forward. It's SUPER efficient. You can have your Trek Madone whatever-it-is.... okay, yes, a good bike... but the Cervelo is something special, make no mistake. Cervelo doesn't even market it as an aero frame, and it's still more aero than just about anything else on the road, and stiffer, and lighter, and stronger. Do the homework. The "S" series.... my personal choice. They dropped the "Soloist" moniker for 2009, but honestly it's a perfect name for this series. I ride a lot of long brevets and permanent rides, by myself. This bike employs technologies from the P-series and the R-series in a perfectly balanced package that acts like a road bike, and cuts through the wind like a tri-bike. The compromises are not just left in, they are engineered out - and the result is better for it. It's not a mongrel or a throw-together, not on your life. The idea is a road bike that gives aero-dymanic advantages to the rider on a breakaway, out alone on a long ride... the soloist. That's me. Honestly, anymore, that's a LOT of us. I see more riders out battling the wind on their own more than I see big pacelines anymore. I see myself on one of these bikes hammering into a wicked headwind on the Border Patrol route for example... you can almost FEEL the seconds dropping off your time. It's remarkable. It's stiff when you stand up on it for a hill. It's compliant when the road gets choppy. The technology has finally arrived to allow designers like Cervelo to bring a really good idea to the road without having to apologize for it. It works exactly how they say it will work. Currently available as the 2008 Soloist Carbon, and the higher-end (lighter, more aero) 2008 SLC-SL model, the 2009 "S"-series will be something to behold, for sure. Oh, and they come in red. Tasty. This one is black and white. It even looks fast on the page, eh? Yes, this is a shot of the '08 SLC-SL. The S-3 moniker replaces the SLC (Soloist carbon) label... but for 2009 it's lighter AND more aero then the previous version. Is it the lightest bike? No. That's not the point of it... it's designed to be the best balance of aerodynamics and weight and strength and stiffness. If you're doing a gram-to-gram comparison, you're not comparing the bikes properly. I'm quite serious - there is SO much more to consider. If you're shopping only on weight, you're doing yourself a grave disservice. BUT, DUDE... you're a STEEL rider! Yes, I am... but, a lot has changed. Carbon technology has advanced SO much, I honestly don't know if you can break one of these without ramming it into a concrete wall. All the mistakes have been made and learned from. Yes: if you're going to spend $1000 on a complete carbon-fiber bike, good luck to you... but at THIS level, the Cervelo, upper-end Trek, upper-end Specialized level - no worries anymore. Notice I didn't say "upper-end" when it came to Cervelo. Correct. If you can't afford the S3, get the S2. You won't be disappointed in the least. Even the '09 S1, being aluminum, is a terrific bike. Back to my point about being a steel guy... I know what a heavy bike feels like. Trust me... the gram game has got to stop. You're giving up being the absolute lightest guy on the block with the S-Series, but you are getting SO much more efficiency with the resulting design. If I can get the same comfort as my steel bike, and an aero-advantage, and it climbs and sprints better.... and it weighs.... (gulp) something on the order of 7 pounds less than my current bike (and that's AFTER I remove the fenders and rack from the Kogswell) -- yikes. Is it an everyday bike? Only if you're paid to train every day. I'd still do the bulk of my training on the Kogswell... but imagine showing up to an event on this Cervelo.... whoooof. Suddenly events like Tejas seem a little more do-able. Yes, I still have to pedal the thing... but lets get serious: ultra-racing, if I really want to get back into it, is a specialized sport. It's like showing up to LeMans in a Fiat 125. Great car. Yes, you can probably drive it for 24 hours. Will you be competitive? Is it the right tool for the competition at hand? Body weight and fitness coming back into line, of course .... all things in their correct order. but, you see my point. It's a competition bike, and if you even PRETEND to ride comeptitively, you need one of these. Solidly made, loads of tech, smooth, sleek, fast, dead-on looks -- this is a great platform, a solid bike. Paired with Dura-Ace or SRAM Red, you have an absolute weapon on your hands here. The Cervelo S3. THAT is my new dream bike. Enjoy. 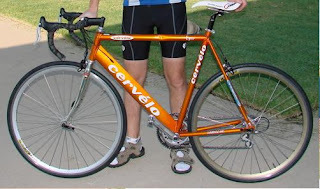 Thanks Keith for the great info on the Cervelos.....and a bad time for me to look at that stuff as I am planning on getting rid of my Trek 1500 in order to find something that will fit me a lot better. I can't ride the Trek 20 miles anymore without having some neck pain, but 50 miles on the Surly LHT - no problems. Even as heavy as that bike is, and 26" wheels, it is still a lot more pleasant to ride. I am having a Jamis Quest brought in to test on Friday to replace the Trek....have you researched those? That vs Cervelo are apples and oranges, but the Quest has some very good components, lightweight steel frame, comfort geometry....just seems right at this point in time for me at least. Well, apples to oranges - maybe: FIT IS EVERYTHING. Your Trek is a fine bike, but if it doesn't fit well, it doesn't matter if you have Dura-Ace or Sunrace 5-speed. You won't want to ride it. I tihnk the Surly proves that ... and arguably, I think the Surly is a fan-TASTIC bike, regardless of weight. It's more of a real-world bike for anything you'd want to do. Jamis, from what I've seen of them, are terrific bikes: it's a bridge between the Trek and the Surly, I think - as far as approach, geometry, etc. It's a classic road bike, much like the Trek 1500 really -- but again, the fit is key. Your 1500 is aluminum, I believe - so the Jamis will feel better on the road. It will be heavier, but honestly weight should not be a concern over comfort. #1, get the right fit. Everything else should be secondary. If youre bike fits you, does what you want it to, and works well, you should never make excuses about weight. Never apologize, or say things like "well, I don't race, so..." Hogwash. You get the right rider on a bike that fits well, even something like the Surly LHT, and someone on a feather-weight racebike: the rider that is more comfortable and has a well-fit bike has a better chance of winning a race than the other guy. I wouldn't even consider the Cervelo if it didn't fit right -- demand it from your sales person. Does the shop offer fitting? Do they know what they are talking about? Don't let them side-talk it, or send you out the door with a new Jamis (or anything) without getting sized-in.